Despite all the changes and the architectural and urban development layering over the centuries, walking through the narrow streets of the historic centre in Naples evokes a strong sense of history and the events that occurred in the neighbourhoods called “le giudecche” where the Jews of Naples once resided. Le giudecche were not ghettos. Indeed there was never a ghetto in Naples. Ghettos were created by the Papacy in 1555 by which time there were no longer any Jews in the city. Today, there are still streets and street names that attest to the Jewish presence in the city and with the help of historical documents and topographical maps the former Jewish areas can be located. While it is unclear where the first Jewish neighbourhood in Naples actually was, several studies have identified San Marcellino and Monterone. This identification is based on the fact that during the war against the Byzantines, the Jews defended the part of the southern wall that bordered their community. However, it is possible that the Jews defended that area because it was the most vulnerable while they actually lived in a different part of the city where, as documents reveal, there was a synagogue. 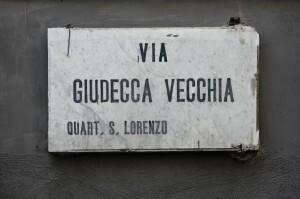 Perhaps the oldest vicus Iudeorum (Latin for Jewish quarter) was further north in what is now the Pendino area, on vico Limoncello, near via Anticaglia, the decumano superiore (one of three parallel streets created at the end of the VI century A.D in the Greek era which constitute the heart of the ancient city). However, with Naples in Byzantine hands, the Jews were forced to move out towards the edge of the city, occupying the street that later came to be known at the 12 Pozzi (12 Wells) thanks to the abundant water supply. Under the Angevin dynasty the street once again became known as dei Giudei, not in recognition of the Jewish presence in the area (the Jews had actually been forced to move from there back to San Marcellino, a previous residence) but rather because it was the practice in the medieval period to restore ancient names to places. La giudecca in San Marcellino was very small. It went from the current via dei Tintori, where the Jews themselves were textile workers, to the steps in San Marcellino where today virtually identical, slightly narrower steps, lead to Corso Umberto, a main artery of the modern city. Fifteenth century accounts attest to the presence of a synagogue in this area, its exact location unclear. It was most likely from the Svevo period in what is now the Forcella area, once again at the edge of the city, perhaps as a result of tense relations with the local population. Via Giudecca Vecchia still exists to this day but eighteenth century urban renewal and expansion left the street with no resemblance to its former self. While urban renewal altered building facades and the external parts of the area, the smaller, internal streets have been preserved virtually untouched and commercial warehouse structures of the time still exist today. Centuries later one can easily imagine the atmosphere at the time in those dark, narrow streets. The giudecca vecchia, thus named at the time to distinguish it from the giudecca nuova, must have stood between vico della Pace and Forcella, That community had returned south to San Marcellino where the giudecca nuova had been during the Angevin period. The giudecca in San Marcellino was slowly growing due to an increase in the Jewish population. The district expanded towards the sea and saw the construction of a new synagogue, which is thought to be the Church of Santa Caterina Sapinacorona, still standing today. Two factors support this theory: the square plan which was somewhat unusual for a church and the fountain with fresh running water from the Rueolo River, a tributary of the Sebeto River, which provided fresh recycled water, an important element when determining the location of a synagogue with a mikvah or ritual bath nearby. 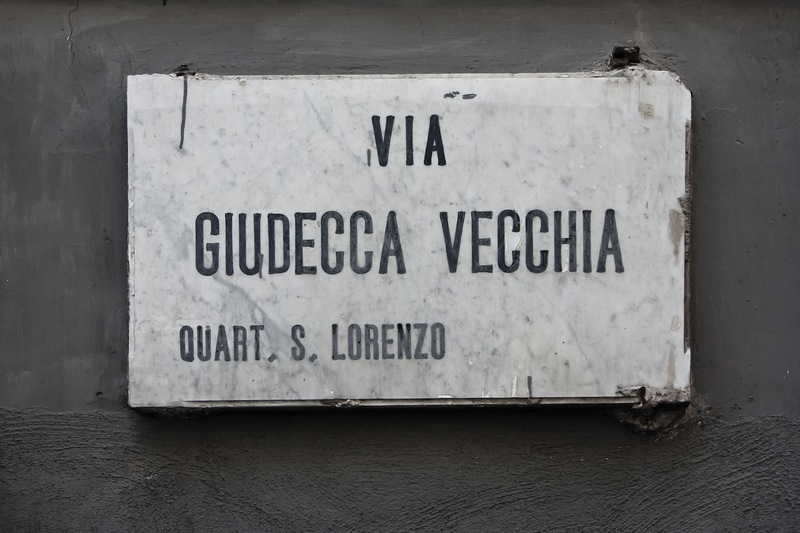 Apart from map indications, there is nothing remaining of the Giudecca Nuova. Bulldozers have eliminated all traces of the expansion of Piazza Portanuova which extended beyond today’s Quattro Palazzi surrounding via Giudecca Grande and its small Jewish neighbourhoods, giudechelle, with significant street names – via Nova della Giudecca Grande, viaAnticaglia della Giudecca, via S.Biagio alla Giudecca – where Jews resided until their expulsion from the kingdom in 1510. Many thanks to Prof. Giancarlo Lacerenza for his invaluable assistance. Centro di Studi Ebraici dell’Università degli Studi di Napoli "L’Orientale"
La memoria non va in vacanza. Università di Salerno.